Cleveland Browns defensive coordinator Ray Horton thinks some of his players are putting too much pressure on themselves late in the game. 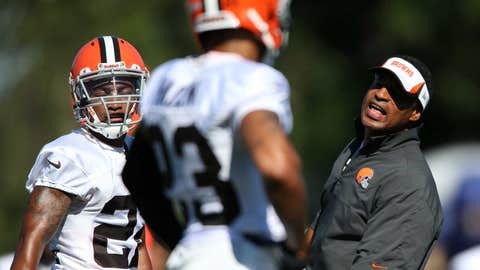 BEREA, Ohio — Defensive coordinator Ray Horton gave his theories for the defenses fourth quarter collapses in recent weeks. He even used LeBron James as an analogy. In the last three games, the Browns defense have given up 47 points in the fourth quarter, including six touchdowns and two field goals during that span. The Browns have given up 49 points, but two were a safety given up by the offense. On the season, the Browns have given up 128 points in the fourth quarter. "It’s highly… it’s very disappointing," Horton said. "We’ve talked to our players about, you cannot play well for three quarters, and then come crunch time, tighten up, because the calls, when you look at them, they’re all the same. The same players, theoretically, are on the field. Their team has run, theoretically, the same plays. So we’ve talked to our players, we’ve looked at our plays and we’ve talked about being clutch in the end. "Some of our players have really played at a Pro Bowl level," he said. "Tashaun Gipson had a Pro Bowl-level game (against the Bears), T.J. (Ward) did. There are a lot of players playing at a high level and the word we’ve used this week to talk to our players is accountability. Some players would say, ‘Well, I’m going to wait for LeBron (James).’ And this is the way I explained it to them: Some of the guys are going to wait for LeBron to go score whatever in the fourth quarter. "Well Tashaun and T.J played like they did but the rest of the guys are accountable to do your job," he said. "Now, some of the job is assist, get the ball to him, get out of the way, block, rebound. Our guys, your job is to know what to do, how to do it, make the tackle, and not commit error. So it’s an accountability thing that you can’t, just because the game’s in the fourth quarter and the game’s a seven-point game one way or another, or a tie, you can’t tighten up and go, ‘I’m going to do something different,’ or, ‘I’m going to wait for somebody’ because we have players that make plays," he said. "We’re talking about the accountability of the game’s going to be close. All of our games except for one-and-a-half or two are close, are one-score games." The Browns have had the lead or been within three points in 11 of the 14 games this season starting the fourth quarter, yet have just four wins on the season. "We need somebody to step up and not take that back step and say, ‘I’m going to wait for somebody else to do it,’" Horton said. "To me, that’s been the biggest disappointment is, our big-time players play well, but we also need our role players do their role. Whether that’s being in the right gap, making the tackle, knowing your assignment, because there’s too many guys playing at a high level for us to be successful for three quarters, and then come crunch time, two minute, kind of play a different-style game." The Browns gave up game-winning touchdowns to the Jaguars and Patriots in the final minute of back-to-back games and then allowed three fourth quarter touchdowns to the Bears last week after leading in the fourth quarter. Horton was asked if he thinks the players are putting too much pressure on themselves late in games. "That could be," he said. "Somebody could be putting the reverse pressure of, ‘I’m going to do it.’ You can have your gap, you can do a different technique. But every play, and we’ve talked about this, every play is weighted the same. Whether it’s the first play or the last play of the game, to me it doesn’t really make a difference." He also said it might be mental. "I know in athletes, it does, because as the clock ticks down, they do (put more pressure on themselves)," There’s a psychological effect on you, but it shouldn’t be that way. One play, to me, the first quarter, the last quarter, they’re all important to me. "I think as the games go on, there’s more pressure to perform well and to not repeat a pattern that happened in the past," he said. "Is there a psychological-pressure effect? I think there is." 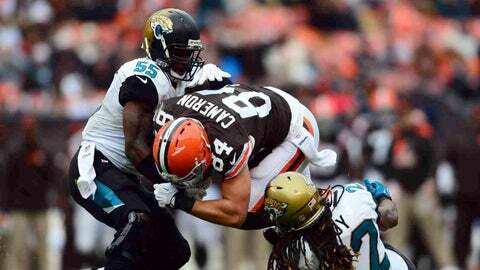 Gipson agreed with Horton’s assessment on the players putting too much pressure on themselves when the game is on the line. "I think it’s very evident," he said. "I think you’ve just got to look at yourself in the mirror and demand more out of yourself. I don’t think it’s nothing that the coaches can coach. I think it should just really start with [the players], and coach Horton has really been on it this week more particularly than others, and I think that it truly comes down to each and every individual that’s going to have an impact on the game to truly just look at himself and say, ‘I’ve got to do my job and my job only. I can’t worry about making a big play. If the play’s going to come by me doing my job than so be it.’ "
Buster Skrine said it comes down to accountability. "It’s accountability," Skrine said. "Every player can’t take a play off when a person is to make a play, he has to make it." Horton refuses to use the excuse of having a very inexperienced secondary at this point of the season. "I don’t want to use any kind of excuse or crutch and say, ‘Well, we’re young, this or that,’" he said. "That’s not acceptable at this point in the season. You have to do your job, you have to be accountable or, at some point, you move on. "We have failed the last three weeks," he said. "I don’t care how you say the game went, the defense was on the field, and we talk about being accountable, we talk about being the backbone of the team. Well, you can’t do that; you don’t do that." After being ranked in the top five, statistically, on defense in the NFL, the Browns are now ranked eighth, overall. However, they are tied for 21st in points allowed, giving up 25.9 a game. Joe a Go: Cameron a No: DB Joe Haden practiced Friday after missing Wednesday and Thursday with a hip pointer suffered against the Bears. 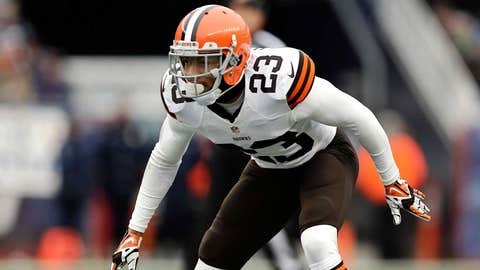 Haden looked pretty mobile during the individual drills and Chudzinski is encouraged that he will be able to go Sunday. "We list him as questionable," he said. "We’ll see in the next couple of days. He was moving around and did some things. We have a couple of days for him to get treatment." Fellow DB T.J. Ward thinks Haden will play. Meanwhile, TE Jordan Cameron (concussion) did not practice the entire week and was ruled out. "He’s feeling better," Chudzinski said. "But he’s not been able to do anything." Others ruled out were OL John Greco (knee) and TE Andre Smith (calf). All other players that were on the report earlier in the week are probable. It is expected that TE Gary Barnidge and TE MarQueis Gray will fill in for Cameron and OL Jason Pinkston will start in place of Greco. Bess Questionable: WR Davone Bess missed Thursday and Friday for personal reasons and is questionable for the game. "He was excused for personal reasons," Chudzinski said. "We’ll have a better idea by Saturday (if he can play)." Turner Upset with ‘Garbage’ Time Comments: Turner took exception to some who criticized the Browns only getting WR Josh Gordon involved at the end of the Bears’ game. The Browns were trailing 38-24 when Gordon caught a 43-yard touchdown pass with 59 seconds left. "I was really excited about the play at the end and I know some people think about it, ‘end of the game garbage time,’ he said. "It’s amazing to me how people have short memories. We scored with a minute left, the same exact time on the clock when New England scored against us, so we had an opportunity to get an onside kick and go score again. That play is a pretty meaningful play and I never take any of those for granted. They mean a lot to me." Turner was asked if the Bears did anything different to keep Gordon from having a big game. "I don’t think they did anything unusual," he said. "The first play (of the game), actually, could have gone to him. We got pressure and Jason (Campbell) went to the other side. We only ran six plays in the first (quarter); we had one drive. "I think we had six plays, they had in the twenties," he said. "Sometimes, games come up like that. It wasn’t that much different than the New England game. When you looked at it, and during the game, I thought there were opportunities for Josh. I thought he could have easily had six or seven catches for another 150 yards. We were just off. We missed him a couple of times and we didn’t throw to him a couple of times when he had chances to make big plays." O-Line Play: Turner was asked how he thought the offensive line has been playing in recent weeks. "I like our protection over the last period of time," Turner said. "I think our guys have gotten a more comfortable feel for our system. I think we’re getting the ball out quicker. There are a lot of things that go into that. Jason (Campbell) had a 20-yard run where it looked like there was good pressure. There’s a lot of things that go into it, but I thought that part of it was good." K2 Being K2: Former Browns TE Kellen Winslow and current Jets TE said he didn’t think anyone on the Browns could cover him. "He’s thought that for years," Chudzinski, who coached Winslow with the Browns said. DB T.J. Ward, who most likely will cover Winslow said he didn’t want to give him any more motivation. "Sometimes, guys just say things to shock guys." By the Numbers: The Jets are ranked 31st in scoring with 17.6 per game, 30th in total yards a game (306.7), 31st in passing yards (178.4) and dead last 32nd in turnover ratio at -19. However, their rushing defense is third in the NFL allowing just 86.1 yards per game. Meanwhile, the Browns are 27th in scoring at 20.6 points per game and tied for 24th in turnover ratio at -6. The Browns offense is 27th in rushing offense at 84.9 per game. Horton Mum on Head Coach Talk: Horton was listed as one of the top candidates among minorities for NFL coaching jobs. He was asked about the report, but declined to speak on the subject. "I think out of respect for (the) New York (Jets), for the Cleveland Browns, I think that’s a question that should be broached at the end of the year," he said. "It has no bearing on anything. It doesn’t help us prepare for New York, so if I could table that until the end of the year, out of respect."